I decided to do a bunch of little projects around the house last weekend on what ended up being a very rainy Saturday (um, and Sunday). 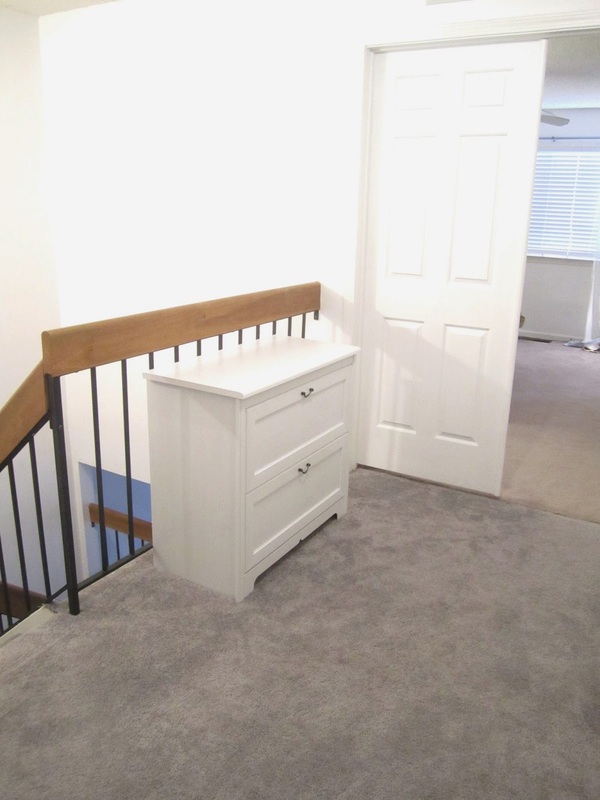 One of them was something I've been meaning to do for awhile but never really happened: decorate the top of the little chest in the upstairs hallway. Here it is before. I bought it from Ikea last year and it's multi-functional: it holds beach towels and sunscreen; it breaks up the weird hallway and hides the railing; and it prevents the kids from playing what I dubbed "stairwell Plinko" (like from the Price is Right) where one stands at the top of the steps and drops something down to the other who stands in the bottom floor of the house. The basket next to the table is from Target (from the Nate Berkus line). I actually bought it months ago and it holds extra blankets. It also hides children playing hide and go seek. As for the top, on the left is a tall white vase from Ikea from years ago; the silver candlestick is from Target from a few years ago; the little topiary is from Target from a few weeks ago (I saw it and loved it and knew I could find a place for it. The two frames in the middle were clearance buys from Target (Nate Berkus) at $3/each around Christmas. On the right is a white lantern that my friend Julia used in her wedding and that she gave to her guests at the end of the night. The faux coral was a buy from Home Goods. I'm really happy with this little vignette! It finally feels like a real space versus just a pass through. I have to order pictures for the frames, but I am holding off until I do my massive order of all shapes and sizes once I figure out my stairwell gallery. For these frames, I think black and white pictures of the kids will look great. It looks beautiful, like the decking details.